This vibrant and colourful retelling of the biblical story about Joseph, his uncanny abilities and his designer coatcomes to the Donald Gordon theatre in May 2017. With a crash of drums and a flash of light, 2010 X-Factor winner Joe McElderry as Joseph continues to dazzle in his coat of many colours. In an energetic and vibrant new staging of the record breaking 1990s London Palladium production, Tim Rice and Andrew Lloyd Webbers family classic is entertaining a whole new generation, with a score which is wall to wall hits – including Close Every Door and Any Dream Will Do. 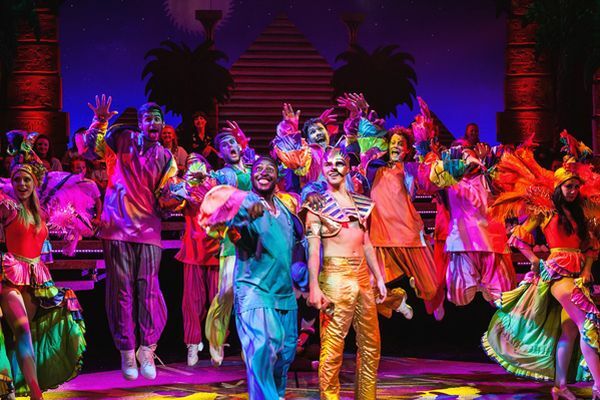 With its mixture of infectious energy and joie de vivre a Joseph and the Amazing Technicolor Dreamcoat Theatre Break is a dream ticket. McElderry was just 18 years old when he won the X-Factor beating Olly Murs into second place. Hailing from South Shields, he was in the middle of a musical theatre course when he auditioned for the ITV talent show and was delighted when Cheryl Cole, a fellow Tyne-sider, became his mentor. Over the last 6 years he has released 3 top ten studio albums. Not content with winning one reality tv talent show, he also won the second series of Popstar to Opera Star on ITV and Channel 4’s first series of The Jump when he was brought in as a replacement for an injured competitor.